Italian Prime Minister Romano Prodi has handed his resignation to the country's president after losing a crucial foreign policy vote in the Senate. President Giorgio Napolitano is now expected to hold talks with political leaders before reaching a decision. He could accept the resignation or ask Mr Prodi to stay in power. In the vote, several of Mr Prodi's coalition partners opposed troop deployments in Afghanistan and plans to expand a US airbase in northern Italy. The BBC's Jonny Dymond says it is not a foregone conclusion that the government will fall. Mr Napolitano has several options, of which dissolving parliament and calling new elections is the most radical. A spokesman for the prime minister said Mr Prodi needed the full support of the coalition if he was to continue. "Prodi has acknowledged this is a serious crisis and he doesn't have a majority in the Senate," Silvio Sircana said. "He is ready to carry on as prime minister if, and only if, he is guaranteed the full support of all the parties in the majority from now on." The coalition's leader in the lower house of parliament, Dario Franceschini, said the main parties in the coalition would continue to back him. "We are ready to renew our full confidence in Prodi," he said. "Let's hope the consultations will be useful to clear things up." Mr Napolitano cut short a trip to Bologna to return to Rome for talks with Mr Prodi. He could also ask Mr Prodi, who took office 10 months ago with a wafer-thin parliamentary majority, to test his support with a confidence vote, ask him to form a new government, choose a different prime minister from the ruling coalition or appoint a government of technocrats. 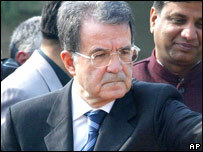 A statement from the president's office said he "reserved his decision" on Mr Prodi's move. Consultations with party leaders would begin at 1000 local time (0900 GMT) on Thursday, and in the meantime Mr Prodi would continue in a caretaker role, it added. Mr Prodi's foreign minister had earlier said the government could resign if it lost the parliamentary motion. The announcement of the result of the vote was met by shouts of "resign! resign!" by right-wing senators. The sitting was suspended shortly afterwards. Foreign Minister Massimo D'Alema had urged senators to approve the motion - which is non-binding - saying unity was crucial for Italy to retain its place on the world stage. The motion asked the Senate to approve the government's foreign policy, a policy which it said was inspired by a repudiation of war and respect for the role of the EU, UN and international alliances. It received 158 votes in favour, just short of the majority of 160 needed for approval, while 136 members of the conservative opposition voted against the motion. Some 24 senators decided to abstain from the vote.